How a Gift Becomes a Fund | Waccamaw Community Foundation | Connecting donors with causes they care about. Becoming a philanthropist is easy when you choose Waccamaw Community Foundation as your partner. 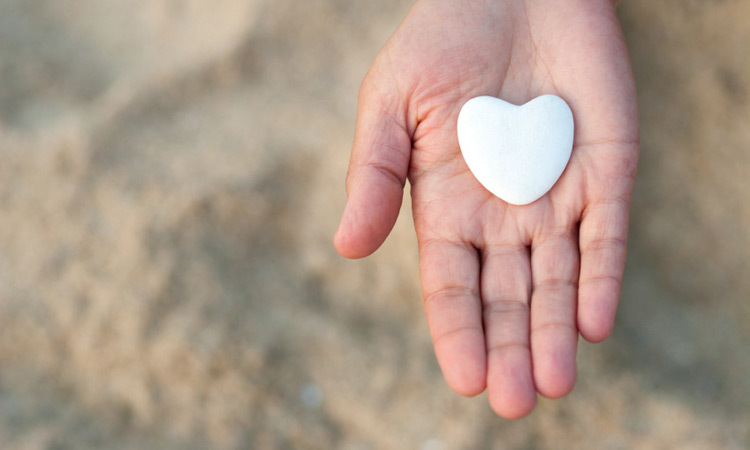 The process of transforming a donor gift into a fund is simple and powerful. For this month’s Waccamaw Wisdom, Karen Minogue walks us through this process using the infograph below. Suggestions for future topics are always welcome at [email protected]. Establishing a fund at Waccamaw Community Foundation or an affiliate community foundation is an easy, effective way to invest in your community. You can focus on specific organizations, issues or regions, or create a fund with a flexible purpose. Funds can be created in as little as one meeting, with a short fund agreement and a single gift. Our staff will work closely with you and your family through the following steps to create your fund. 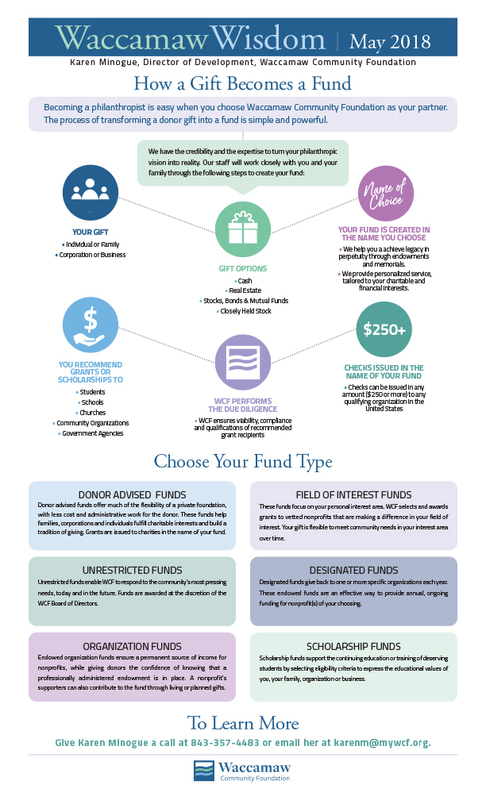 WCF offers a variety of fund types to help you achieve maximum impact in the areas that matter to you. When you remember WCF in your will, you may reduce your estate taxes while supporting your community. Community foundations have one thing in common – uniting people from all walks of life who have the desire to make a difference in their community. Whether your income is fixed, average or above the norm, you can give back to your community with the help of Waccamaw Community Foundation. The Power of Endowing your Fund. Your Charitable Plan Made Permanent. Provide dependable, perpetual income to your chosen cause or nonprofit – be it the arts, your house of worship, your alma mater or whatever cause you love. Carry on your family’s name (or the name of your business) – and legacy, forever. Allow successive generations to continue a giving tradition. Endowments offer magnificent benefits to your favorite nonprofits. Depending on their size, an endowment could mean the difference between vitality and bankruptcy, or creativity and complacency. We think you’ll find us unlike any other nonprofit you’ve ever met! Why? Because our business is helping YOU give. You choose the cause or the nonprofit. We make sure your charitable gifts are processed in a timely and efficient manner. Need some creativity, advice and inspiration? We can provide that too. If you have not yet started a fund, or have a desire to do so but are not quite ready, consider a gift to WCF for a future fund or contact us to learn about adding your gift to a fund already serving causes of importance to you. We are here to serve as a resource for you. Give Karen Minogue a call at (843) 357-4483 or email her at [email protected]. This blog does not provide legal or tax advice. Consult your independent attorney, accountant and tax advisor before implementing any financial, tax, or estate planning strategy. © Waccamaw Community Foundation 2018.